We are developing an augmented reality game called SaveTheEmoji. The development of this game was inspired by the idea to be more physically active while playing with special and unique options like “tap with phone to save running emoji”. The game uses ARKit and will require iPhone 6s, 6s Plus, 7, 7 Plus, iPhone SE, 8, 8 Plus, X or iPad Pro (9.7, 10.5 or 12.9), iPad (2017) or later devices. If you remember the heydays of Pokemon Go and became entrenched in the game full on, then you have a new adventure to try. 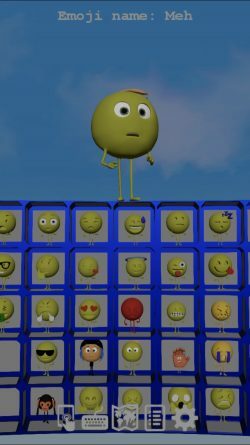 Save the Emoji is a semi virtual/augmented reality game that sets you on a course for adventure to seek out and save emojis. 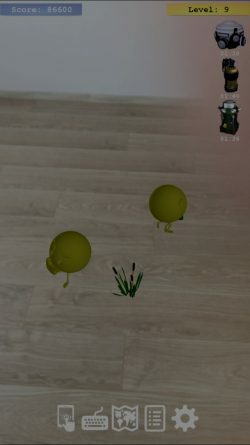 If you think emojis are fun and like to move around, then this game is something that you will get a kick out of - game that runs using augmented reality (AR), immersing you in a whole new world teeming with emojis that may be just hanging around or that may be running around, forcing you to follow! The game provides long term entertainment, because every day is different and the emojis you will encounter will vary, from day to day and from location to location. This makes the game different every time you are in a different place: at home, at work, out shopping, on vacation – you get the picture. 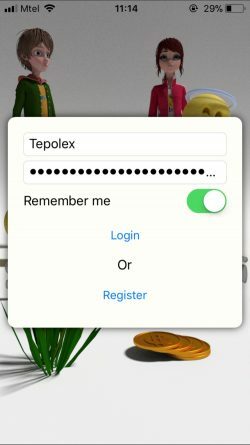 Once you download you will be asked to register using an email address. The app does not ask for much. It will also ask to have access to your camera and gps location, which you will need to play the game. The Settings can be adjusted per your taste by tapping on the “gear” looking icon at the bottom of the screen. If you wish to use items, you can do so by tapping on the icon that looks like a paper sheet with a list. There is a gravity controller which slows down emojis who are trying to run away from you. There is a score velocity booster that earns you more points per emoji that you otherwise would have achieved. 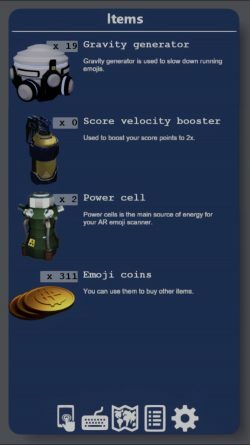 There is a power cell that boosts your emoji scanner power, and you have emoji coins with which to purchase these powerful tools. The leftmost icon shows you the AR emoji camera scanner - a phone screen with a finger and this is your start game screen as well. The icon that looks like a keyboard will show you the keyboard of your saved emojis. At first, obviously, it will be empty. But, as you explore more and tap on emoji to save them, you will fill this grid and earn points. Let’s get to the points part. Earn points and be the leader on the game, because you can compete against others who are out there doing the same. Save the Emoji is fully interactive game driven by your location and GPS functionality. 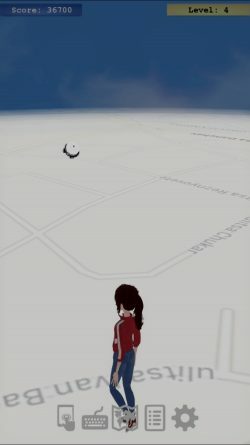 It casts you as the main player, who in this case, is a person (boy or girl) who walks around the vicinity of your current location. 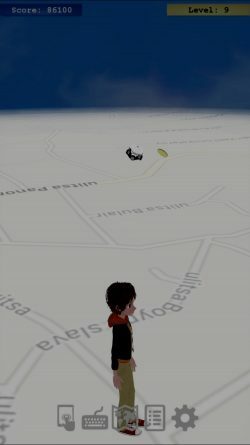 As you walk, you will see your exact location on the map, which is shown in the background. You walk and the map displays where you are and in what direction you are moving. You could collect items from the map and use them later in the game. There are different levels of game play, so as you collect more emojis and get better at doing so, your challenges will increase. For instance, initially the emojis will be slow. You will see them on your AR scanner as you walk around. Slow emojis are easy to get to and save. With increasing levels of difficulty, you will see that the emojis get smarter and find ways to avoid and escape your capture. This is where the tools or items becomes extremely essential and helpful. That’s why it’s so important to collect as many coins and items as possible so you have buying power later in the game. If you want to become a tester - PM us here. Mod note: We don’t typically allow apps that aren’t currently available to be posted to our forum but, since you already have an approved listing on iTunes, I am going to allow it. Also, I removed your email address per our Community Rules & Guidelines. Please utilize forum PM for beta testing requests. Thanks. Welcome to iMore and good luck with your app.